= Toire no beppin na megami wa watashi desu. Hello, everyone! I have just posted ありがとう ( = arigatou) Thank you, lesson. It is kind of related to the subject but I would like to teach you a Japanese song today. 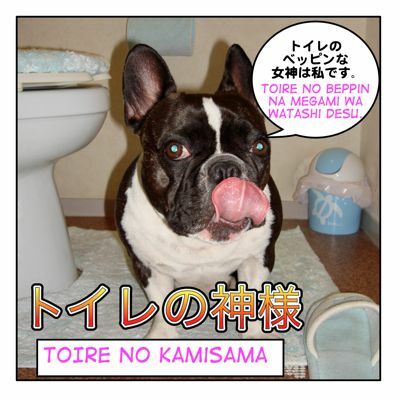 It is called 「トイレの神様」 ( = Toire no kamisama) “Goddess in the toilet” And it is getting popular! This song is sung by 植村花菜, ( = Kana Uemura). Her real relationship with her grandma — who she lived with from the ages of 9 and 15 inspired her to write the lyrics. It’s a 10 minute-song and it is nothing like J-pop bands like Exile, 嵐 ( = Arashi), or 浜崎あゆみ ( = Hamazaki Ayumi) would sing but many people say they cried listening to this song because it hit something deep inside our hearts. Many of us identify with her experiences, and I myself miss my grandma a lot while listening to this song. So if you feel something while listening to the lyrics of this song, then you can take that as evidence that your Japanese has really improved! First, let’s listen to the lyrics and see if you understand them. = Shou san no koro kara naze daka obaachan to kurashiteta. = Chotto hanashita dakedatta noni “Mou kaerii” tte byoushitu wo dasareta. OK, I will explain the lyrics line by line. ← the abbreviation of 小学校3年生 ( = shougakkou sannensei) the third grade of elementary school. We often abbreviate the grade. For some reason, I used to live with my grandma since I was in the third grade. • 実家 ( = jikka) my home, my parent’s house where I was raised. My parents house was next door but I lived with my grandma. I used to help my grandma everyday and we played goban together. = It was sooooo yummy! •いるんやで ( = irunyade) Kansai (western part of Japan) dialect. You know, there is a very beautiful Goddess in the toilet. That is why if you clean it every day, you will become very beautiful like a Goddess. •ピカピカに ( = pikapika ni) to make it shine ピカピカ ( = pikapika) We use it to describe something shining or something news. Ex. ピカピカの一年生 ( = Pika pika no ichinen sei) Fresh first grader. From that day on, I started cleaning the toilet very well until it sparkled. →毎日磨いてた ( = migaiteta) use to polish (something) every day. I polished it everyday because I really wanted to be beautiful. 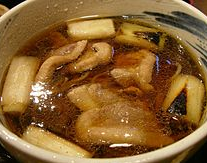 •鴨なんば ( = kamo nanba) = 鴨南蛮 ( = kamo nanban) Japanese noodles with duck meat. When we went out for shopping, we ate kamonanba, noodle with duck meat, together. • 新喜劇 ( = shinkigeki) the literal meaning is new comedy theater. It refers 吉本新喜劇 ( = Yoshimoto Shinkigeki) a major comedy group in Kansai. When I got a little older, I bumped heads with my grandma. Also I couldn’t get along well with my family and couldn’t fit in. I hung out with my boyfriend on my day-offs and didn’t go back home. Gobang and Kamonanba (noodle with duck meat) had disappeared from us. This is a poetic way to explain that something special between the two of them had disappeared. I left home alone leaving my grandma who was always on my side. →上京して２年が過ぎて ( = joukyou shite ninen ga sugite) two years have passed since I moved to Tokyo and..
Two years have passed since I came (or went) to Tokyo and my grandma was hospitalized. I went to see my grandma who gotten skinnier and thinner. = Go home now./Why don’t you go home already. We talked just a little bit and my grandma told me “Go home already!” and she urged me to leave. 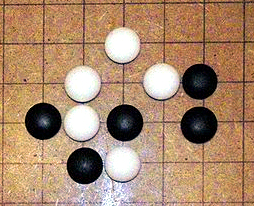 Note: 眠りにつく ( = nemuri ni tsuku) has two meaning. The literal meaning is to fall in sleep. It also means to pass away. The next day, my grandma passed away quietly. I was not a good g randchild but she was waiting for me. I wonder if her words made me beautiful. There is a very very beautiful Goddess in the toilet. So if you clean it every day, you will be as beautiful as a Goddess. (Since) my dream is to be a sweet wife. I clean the bathroom very hard until it gets nice and clean everyday. Thank you, Granny, from the bottom of my heart. :maggie-small: Now listen to the song again until you cry! !Cry! = Watashi no you ni beppin san ni naritakereba kyou kara toire wo pikapika ni souji shitene. = If you want to be as beautiful as me, start cleaning the bathroom until it shines from today. = Sorekara taisetsu na hito ni “Arigatou”tte osoku naru mae ni itte kudasai. = And say thank you to someone who you care about before it gets too late! = Watashi mo obaachan ni aitai you! = I miss my grandma! Maggie san, thank you so much for the lyrics and the excellent explanation. I was looking for this song just after I saw the movie (filmed in 2011) and it made me cry. What a great song and a great movie as well! どうしてだろう人は人を傷つけ大切なものをなくしてく is my favourite phrase! Thank you for nice Japanese lessons. These lessons really help me improved not only Japanese but knowing Japanese cultures too! I’m glad to hear you like this lesson. That’s a nice song, huh? Thank you for this! It is wonderful! I have a question about verse 22. One can’t tell in English if her grandmother told her to go home because she was upset or for another reason. Does the original give any hints as to why obachaan told Kana to go home? No, neither original (Japanese) verse doesn’t say the reason. You have to read between the lines. Of course, obaachan wants her to stay but probably she doesn’t want her grandchild to see her getting weaker or make her feel sad or worry. Actually that is the saddest line in this song. What a great song. It must have been so much work to translate, but I love to learn new words from listening to songs ^^ I’m going to check out more songs from 植村花菜 now! Isn’t it great??? I love this song. I think she has just released a new song recently. But this one is my favorite!! Will make a lesson if I find an interesting song to learn Japanese again! There’s something that is worrying me profoundly as a translator. You have shown us that 別嬪 is an old-fashioned word. I’ve looked up that word in my monolingual and bilingual dictionaries and couldn’t find any reference to it being old-fashioned. How can I know when a word is colloquial/old-fashioned/vulgar when I look it up in the dictionary? Is there any dictionary with this sort of indications (monolingual or bilingual)? It would be very useful. I don’t want to pester Japanese friends every time I have to find out. Good question. If it is a very old word, some Japanese dictionaries (for example 広辞苑) indicate it as < 文語> and if it is a colloquial word, it says < 口語>, and if it is a vulgar word, it says < 卑語>. But you can also use “Google” and check the number of hits and how people use the word and you can judge yourself. have you CD translated to romanji ? thanks a lot see you….. Thank you for your comment. I make lessons but I don’t know much about google blogger,etc. Will ask my homepage builder to figure out your request. Thank you for checking the lesson. I am glad to hear you like it! Please come back. Thank you! You are awesome,too! Thank you for your comment. You can get the song through iTune. You can always use Youtube! Nee, Maggie sensei could you tell me where can I download it?